One day I was in the elevator (It seems like a lot of my daily anecdotes start this way. Apparently I spent my entire life going up and down buildings. I know some folks do that as a hobby, but people, that’s really not the way you should live your life, even if you are clinically insane). Where was I? Oh. One day I was in the elevator with a friend who is taller than me. 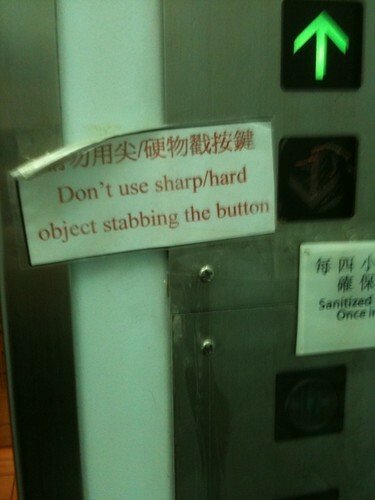 We both looked at the sign above, which says we should not stab the buttons with sharp objects. Guys being guys, the reference to “sharp objects” made us incapable of coherent thoughts as our (thinking) blood rushed involuntary to the only object on us which could do the (warned against) deed. I jokingly said that that warning doesn’t apply to me, since the highest I could reach would probably be the second floor, or something. Parts of me felt very small that day.